The blue curves show the δOxygen-18 values for NorthGRIP in Greenland (top) and WAIS in Antarctica (bottom) for the last 20,000 years. The black dots are 1,000 years values, and the far left hand side of the curves are present day values. New Year’s Eve is just around the corner and the last “image of the week” of 2016 will get you in the mood for a party. If your celebration needs a soundtrack with a suitably geeky touch then look no further. 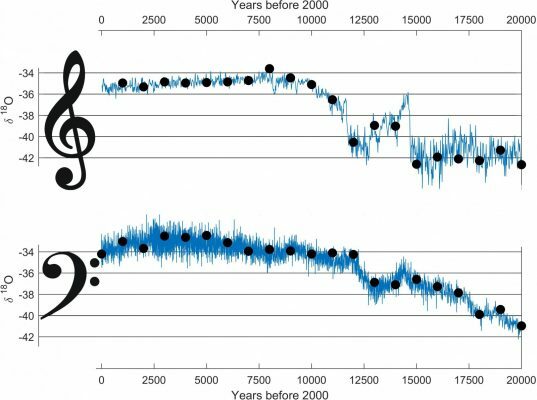 Here is the music for climate enthusiasts: The sound of the past 60,000 years of climate. Scientist Aslak Grinsted (Centre for Ice and Climate, University of Copenhagen, Denmark) has transformed the δOxygen-18 values from the Greenland NorthGRIP ice core and the Antarctic WAIS ice core into music (you can read more about ice cores in our Ice Cores for Dummies post). Using the Greenlandic data as melody and the Antarctic data as bassline, Aslak has produced some compelling music. You can listen to his composition and read more about his approach here. The δOxygen-18 values are a measure of the isotopic composition of the ice, and they are a direct indicator of temperature. The image of the week above shows the isotope values for the past 20,000 years as measured by polar ice cores. On the left-hand side, we are in present-day: an inter-glacial. The δOxygen-18 values are high indicating high temperatures. In contrast, on the right-hand side of the figure we are in the last glacial with lower δOxygen-18 values and lower temperatures. One remarkable thing about these curves is how fast the temperature changes in Greenland (top) compared to Antarctica (bottom). This delayed coupling is called the Bipolar Seesaw. The clefs are our own addition of course. We have not included the time signature because who knows what the rhythm of the climate might be? (Personally, I think it might be in ¾ like a waltz: An unrestrained movement forward with small underlying variations). The data from Antarctica is published by WAIS Divide Project Members, 2015. The Greenlandic data can be found on the Centre for Ice and Climate website and in publications by Vinther et al., 2006, Rasmussen et al., 2006, Andersen et al., 2006 and Svensson et al., 2006. Science and Shovels: Traversing across the Greenland Ice Sheet.